Lights off, television off, phone off, if only I could just for a moment take my throbbing skull off, too. Migraine pain is an unfortunate reality in my life. Pain so nauseatingly extreme that I can't even imagine being able to shed tears about the level of intensity. 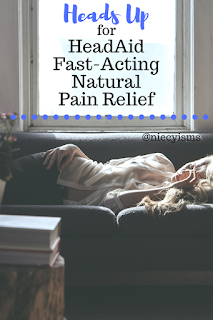 Flashbacks of my ongoing struggles with pain management bring cringe-worthy feelings to the surface, even as at this moment, I prepare to consume HeadAid to treat my current migraine. Thank you to the team from HeadAid for the opportunity to preview promotional product for the purpose of facilitating this advertorial content. Migraine and headache pain are barriers to productivity for millions of sufferers on a daily basis. Just recently, I personally had the opportunity to put HeadAid Fast Acting Day Dietary Supplement to the test against the onset of yet another debilitating migraine. 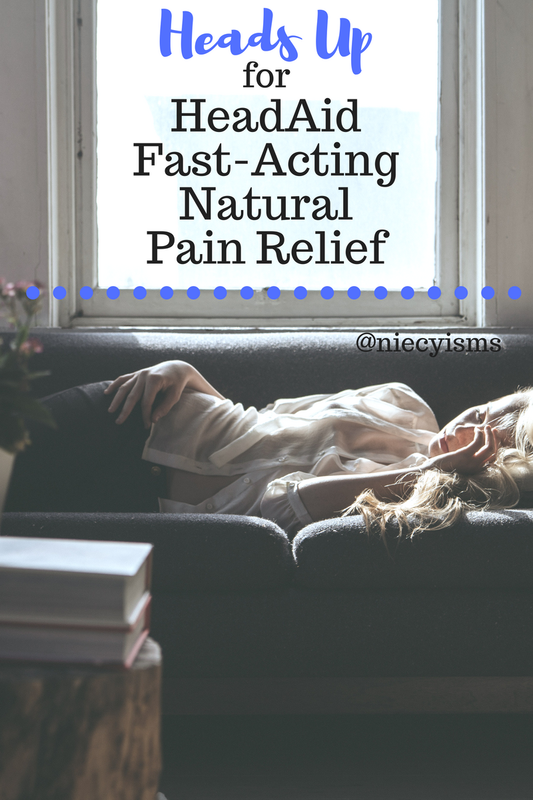 Offering a simple, natural, affordably priced solution with minimal drug interactions, side effects, and risk of “medication overuse,” each 0.24 oz packet is easily mixed into an 8-12 oz glass of water for fast-acting pain relief. The Lemon Ginger flavor supplement performed surprisingly well against the oncoming migraine and with a distinct Ginger flavor, there were no upset stomach symptoms to report. The fast-acting daytime and nighttime, natural HeadAid supplement blends specially formulated to target the typical symptoms associated with headaches and migraines, such as nausea, vomiting, insomnia, and mental fatigue. “Migraines and concussions do not have to paralyze patients or leave them feeling “drugged” with the accompanying treatments. HeadAid capitalizes on all-natural supplements that target the pathophysiology of migraine. It’s scientifically smart. HeadAid complements any migraine regimen with little to no drug-drug interactions, and is a product that greatly expands a patient’s options, particularly when trying to avoid medication overuse. I personally have implemented HeadAid into my own migraine regimen.” states Dr. Patricia Scripko, Harvard-trained Neurologist and Chief Scientific Advisor to HeadAid. Daily Mixed Berry - is the first of its kind to include melatonin for its anti-inflammatory properties that are as strong as NSAIDs but without the side effects and vascular risks. Melatonin also helps regulate sleep. Both of these actions are thought to result in melatonin’s benefit in reducing migraine frequency and intensity. It also has magnesium, riboflavin and coenzymeQ10 for their long-known benefits in prevention of migraine. Fast Acting Night Chamomile Ginger - This blend was created for the migraineur who wants to rest or sleep through their migraine. It includes chamomile and 5-HTP to help reduce pain and get rest, as well as ginger to assist with nausea and gut motility and magnesium to reduce light sensitivity and aura. Fast Acting Day Lemon Ginger - This solution was created for someone who needs to work through their migraine. It contains caffeine to offset the common migraine-induced “brain fog,” as well as reduce headache pain, and includes magnesium to reduce light sensitivity and aura, as well as ginger to aid with nausea and gut motility. Medical Disclaimer - The medical information on this site is provided as an information resource only, and is not to be used or relied on for any diagnostic or treatment purposes. This information is not intended to be patient education, does not create any patient-physician relationship, and should not be used as a substitute for professional diagnosis and treatment. Please consult your health care provider before making any healthcare decisions or for guidance about a specific medical condition. Find out more about HeadAid natural pain solutions at headaid.net.